The devil might have all the best tunes but does he have the best slots too? We can find out with the launch of Devil’s Number. Also hitting the online casino shelves is the latest slot to use the MegaWays game engine, Wolf Legend MegaWays. Let’s take a closer look at them both. Created by Red Tiger Gaming, Devil’s Number is a 5 reel, 30 payline slot that comes with some pretty fiery extras. In the base game you could benefit from the Upgrade or Remove features. The former delivers a payout boost if you land a winner made up of 1 of the higher value scroll, book, cauldron or potion bottle symbols. For example, a 5-symbol potion combo normally pays 12 times your stake but with the upgrade, it delivers 22.2 times your stake (or 666 coins). The Remove feature can trigger when you land a winner made up of lower value symbols. They’re removed and a symbol drop takes place, offering a second chance to create a winning combination. The Free Spins feature awards 12 free spins. The Upgrade and Remove extras are both in play throughout the free spins so you can expect plenty of action here. With more free spins to be won, it’s the best chance to win big in reality. The design in Devil’s Number is done comic book style and works pretty well. Likewise, the heavy rock soundtrack. With its classy sound and visuals and range of extras, this is a fairly typical slot from Red Tiger Gaming. You can also pocket 2,500 times your stake on each spin/free spin – go to the Devil’s Number slot review for full details. The second new release, Wolf Legend MegaWays, comes from Blueprint Gaming. It’s a 6 reel, game where the number of ways to win can reach 117,649 if the reels reach their maximum size. Blueprint Gaming slots are usually easy on the eye and that’s true of Wolf Legend MegaWays. You’ll see a selection of wild animals spinning around the reels. The Cascading Symbols feature delivers plenty of base game action. On any spin, you could see Mystery Symbols hit too. These all transform into the same matching symbol and a new payout calculation is made. The main feature is the Golden Streak feature – you’ll be awarded 3 streak respins to try and increase your tally of free spins. You can then try a spin the wheel gamble round to try and get even more free spins. If you’re unsuccessful here, you’ll lose the lot though. The Free Spins feature then begins, complete with cascading reels which increase a multiplier by 1x every time a new cascade hits. These don’t reset after a winless free spin either. If you wish, you’ll also have the chance to buy your way into the feature. 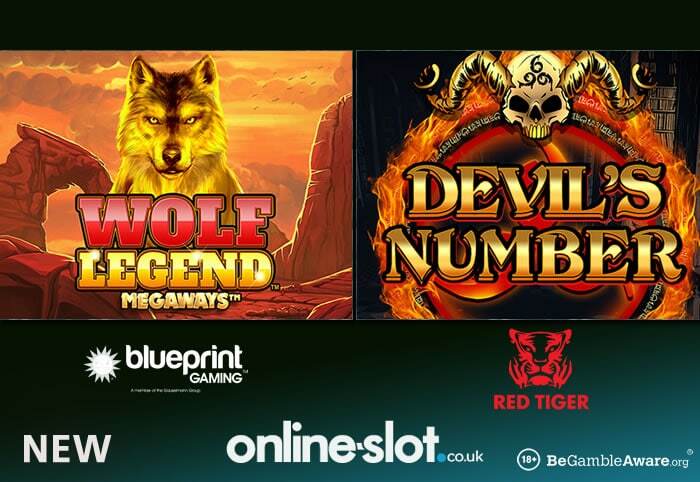 Wolf Legend MegaWays is another impressive addition to Blueprint Gaming’s MegaWays catalogue. Well designed as usual, it delivers plenty on the features front too. This trip to the wild American wilderness can give you wins of 50,000 times your stake on each free spin too – go to the Wolf Legend MegaWays slot review for a full rundown. Both Devil’s Number and Wolf Legend MegaWays are out now.